Hi, guys! It's been a while. 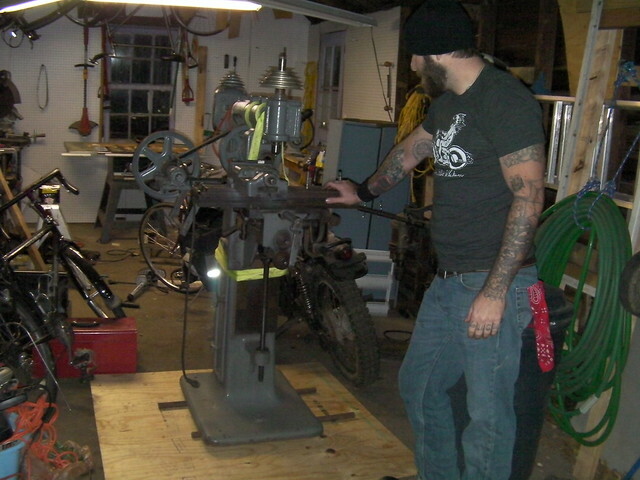 Some of you may remember the janky and frightening mill-like contraption I have been using to "mill". Well, I finally had both the resources and the opportunity to upgrade. I got my hands on a Kempsmith horizontal mill with a vertical attachment and some shop-built add ons. I got this thing for a song, and the guy even loaded it for me. All I needed to do was get it in the shop. 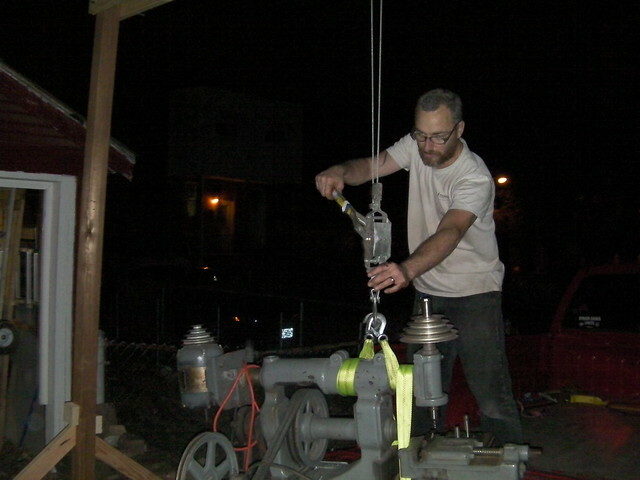 After we got it down, we put plywood on the ground, chopped some old plumbing pipe to length, and used it as rollers to push the thing around. Worked fine. It's sitting in the garage, waiting for me to make it a new home. BTW, lest anyone start talking about safety, everything within this system was rated at at least 2000 lb, twice the weight of the mill. The only thing that didn't have a rating was the hoist frame, and I overbuilt it as much as I could afford. No one was allowed near the load or under the frame until the load was almost on the ground and the danger of a collapse was minimal. 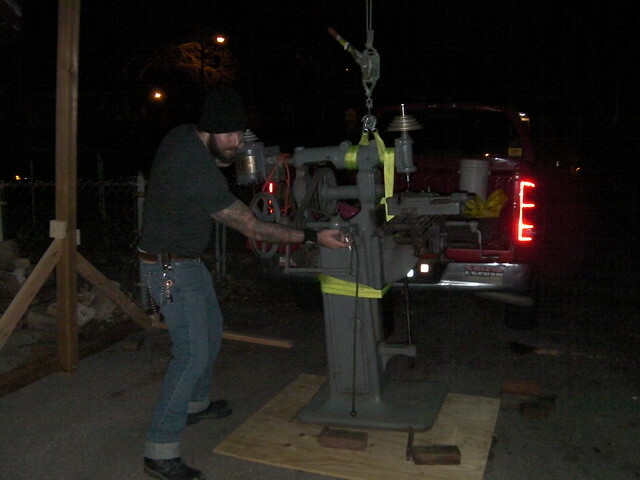 We hoisted the machine, let it hang just off the bed of the truck for a while to load test it, shifted it a bit to make sure it was stable with a moving load, then slowly drove the truck out from under it. We then ratchet it down, from as far out of the line of action as possible, until it was just touching the rollers, at which point my friend steadied the load while I dropped it the rest of the way. Probably should have had hardhats, though. On reflection, I really should have beefed up the braces on the legs. They held fine, but if we had somehow got into dynamic loading, there could have been problems. 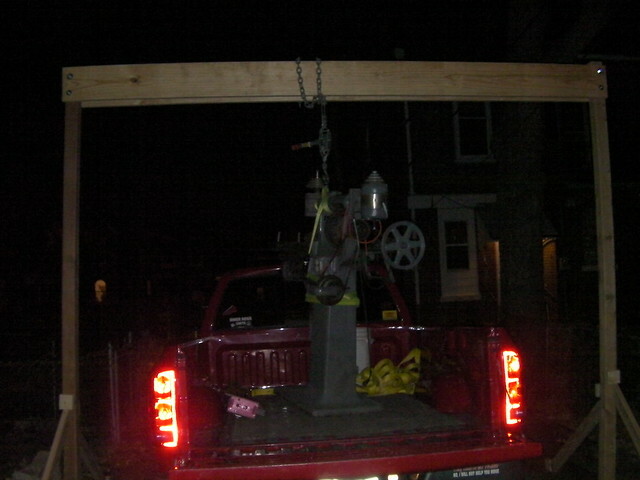 Yes, I would have preferred to wait till morning and rent a hoist, but I was on a tight schedule because the truck had to be back so the owner could drive it for work. 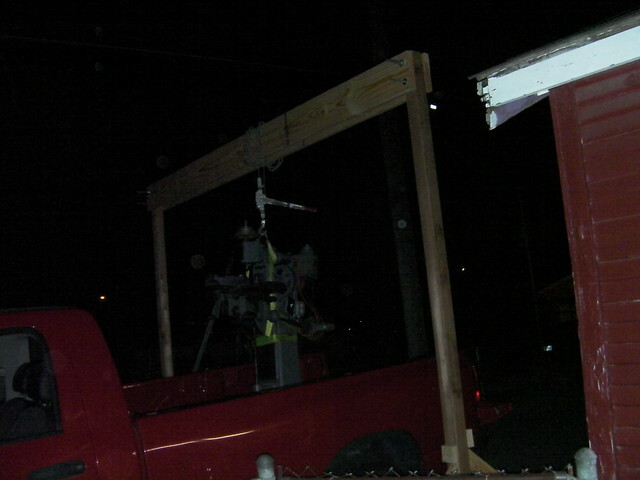 Re: Shop built temporary hoist. Nice to see common sense, and ingenuity. Without that, few projects would ever be attempted! The number of times I have had similar experiences, then when the jobs done, you can't believe you did it, but what a nice feeling that you did do it. Looks like a good solid machine.